Slate Cheese Board for sale. Buy online at Zingerman's Mail Order. Gourmet Gifts. Food Gifts. Cheese looks drop dead gorgeous when it's served on dark-colored, textured surfaces. 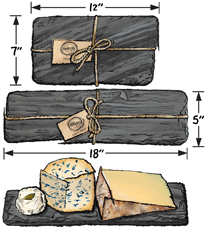 These slate slabs, rough-hewn and shadowed, make perfect cheese boards. Choose from two shapes: long and rectangular, five by eighteen inches (my favorite), or more squared, seven by twelve inches (the most popular). Quarried and cut from New York state slate. They come wrapped in a burlap which makes a rustic gift bag—a great gift for a cheese lover. Soapstone pencils work great as chalk on slate.